SlotsMillion is an award winning casino that was founded by Alea Gambling and a team of professional land based casino expert. It’s no wonder this operator was the very first one to launch a virtual online casino which aims to replicate the real casino feeling. Always one step ahead of the competition, they operate under 2 gaming authorities the MGA (Malta Gaming Authority) and Curacao. Which means players from all counties will have access to a wide variety of games dues to their license coverage. At SlotsMillion players are valued and they are welcomed with a 100% bonus up to £100. Players will also receive 100 free spins in a safe and easy to play casino environment which is available on a desktop or mobile device. The free spins of the welcome package can be played across many game title including Gonzo’s Quest, Twin Spins, Jack and the Beanstalk, Spinata Grande and Fruit Shop. The spins can be played on a desktop or on a mobile device. And will be awarded to players over the course of 5 days by instalment of 20 per days. Players who want to be the first at trying the 3D virtual casino will need to do so on a desktop because the technology is not yet available on smartphones and tablets. A great thing is that the free spins which make the welcome package can also be claimed in the VR casino. The site is currently available in English, Swedish, Finnish and Norwegian. The promotion section of the site has a lot to offer. From ladies night to gentleman night and happy hours too! There’s loads of fun to have on this website and many bonuses to claim! There’s over 1400 games to play from award-winning provider. Such as NetEnt, Playtech, Microgaming, iSoftbet, NextGen, iSoftBet, Rival, Saucify, Games DS, Cryptologic, Leander Games 1×2 gaming, Elk Studio, Genesis, Thunderkick, Rabcat, WangerMill, Big Time Gaming, 2by2 Gaming, QuickSpin, PlayNGo, BetSoft, Lightning Box, PlaySon, Nektan, Casino Technology MGA, Pragmatic Play, Red Tiger, Ainsworth gaming, Blue Print Gaming, Yggdrasil gaming, Noble, Merkur Gaming and Felix Gaming. The virtual reality casino gives players the opportunity to play 40 game titles We’re certain that more games will soon be integrated. What payment methods are offered on SlotsMillion? Players who wish to take advantage of the welcome offer can do so by topping up their account using any of the following payment methods. Visa, MasterCard, Maestro, Skrill, Neteller, Paysafe Card, Zimpler, and wire transfer. 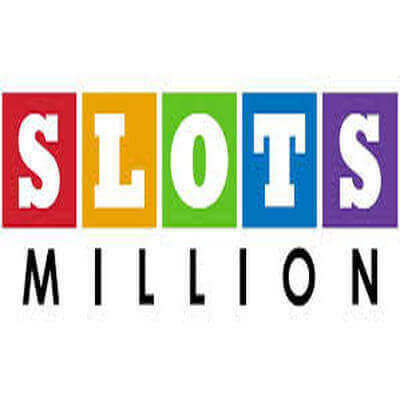 SlotsMillion does not take any fees for any deposit transaction. The minimum deposit is set at £20 – £50 depending on the payment method used by players. What about the wagering requirements of offers? We always encourage players who chose to claim a bonus to carefully read the terms and conditions before claiming it. Especially that on SlotsMillion they are very clean and displayed below any offers in bullet points on the promotion page and cannot be missed! If you do not feel like reading the fine print of the general terms and conditions. Here are a few points that are important to know. In order to activate a bonus, a deposit of £25 is required. All bonuses have wagering requirements of x35 (bonus only) which must be completed within 7 days. The £10 free cash bonus offered to new players upon deposit comes with a conversion limit which is set at £45. 1. Players who have claimed a bonus cannot place a bet over £10. 2. Players are free to withdraw their real money balance. Even if you have bonuses active. This is because players will always play with real money first then with bonus funds. 3. Players can have more the one bonus active. Any game activity will always contribute towards the wagering requirements of the oldest bonus. There are close to 90 games which cannot be played with bonus funds. Those games include low volatility slots and also progressive jackpot games. What about the customer care department? The team of supports agents are carefully selected for their game knowledge and friendliness. They can be reached via live chat, email and phone lines 24/7. Why not heading over to SlotsMillion now and discover the future of online casino and new games!